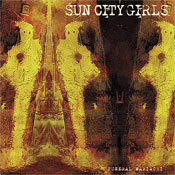 In stunning fashion, Sun City Girls' final studio record caps a 27 year run for what many hail as the most bizarre, eclectic and provocative musical trio ever assembled. From the delirious intro of Ben's Radio to the final drum crash of the title track, Funeral Mariachi delivers eleven well-crafted gems which display the refined studio production side of SCG shrouded in that otherworldly glow which has always separated the group from their contemporaries. Beyond the gorgeous folk & vocal styles which drive the album, there is a heavy retro Italian cinema influence, Arabic and Indonesian references, and a ghostly psychedelic moodiness throughout. Post-production and final mastering was completed by the Bishop Brothers after the untimely death of Charles Gocher in 2007 and the results will not disappoint followers of this impossible to describe unit. Funeral Mariachi provides a perfect introduction to the more melodic sector of the SCG universe surfacing, ironically, at the end of their career in the form of what someday should become one of the most beloved records they ever created. Limited one time only vinyl pressing housed in a beautiful, heavy duty full-color gatefold jacket with the back cover photo taken during the last SCG photo session in 2006. Mastered by Ed Brooks at RFI Mastering/Seattle.